Containing eight science fiction/fantasy stories, Quantum Convention has a story for all tastes. A man sneaks away from his wife to a Quantum Convention where he meets himself from 100 different universes each where a single different decision was made. An orphan finds a career as a professional mourner. A young boy discovers his true self in his love of dressing up as Dorothy while the Wicked Witch loses herself in her role. A group meeting whose goal is to make better decisions in dreams. A young girl’s unique relationship with Jesus. A man realizes his neighbor is Merlin the Wizard. A one-eyed boy finds a friend. The marriage of a college roommate makes a man question his sexuality. 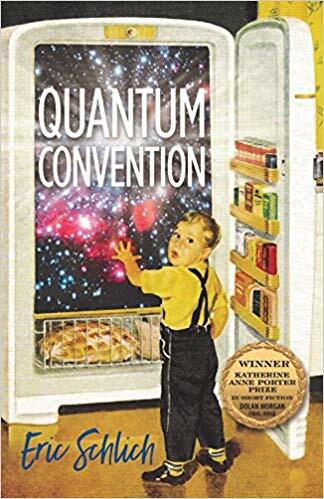 Quantum Convention is more literary fiction than the advertised science fiction/fantasy. However, each story makes you reflect long after the story is complete. I had my favorites as will you. Quantum Convention is good choice when you are feeling philosophical. 3.5 stars! Thanks to University of North Texas Press and NetGalley for an advance copy in exchange for an honest review.